A young adult conference will be March 2, 2019 at the University of Saint Francis. The mission of the Assisi Conference is to encourage young adults to dive deeply into the mystery of the Incarnation, which is at the heart of Franciscan spirituality. The participants of this conference will have the opportunity for small group discussion, excellent speakers, and the sacraments. The conference will end on March 3rd with Mass celebrated by Bishop Rhoades. This conference will reinvigorate young adult Catholic community down to the local and parish level. Blessed Sacrament Parish will have a baked steak dinner and basket auction on Saturday, March 2, from 5-8 p.m. Baked steak, mashed potatoes and gravy, green beans, salad, dessert and drink, will be offered to those age 6 and up for $10, to those 3-6 for $3 and to those 2 and under free. Basket Auction begins at 6 p.m. Proceeds will benefit the high school trip to the Steubenville Conference. Holy Family Parish Center, 56405 Mayflower Rd., will host a Las Vegas night Saturday, March 2, from 6-11 p.m. with Blackjack, Big Six, other gaming, tips and raffle. Tickets are $8 in advance and $10 at the door. Tickets include free food and drinks and $1000 drawing. Bishop Rhoades will attend Saints Alive! dinner and auction at Bishop Dwenger High School on Saturday, March 2. Doors open at 6 p.m. The Saints Alive! dinner and auction will be Saturday, March 2, at 6:30 p.m. in the Bishop Dwenger main gym. Tickets are $350 per couple. A live auction, four interactive silent auction booths and the Tuition Assistance Challenge will be offered while enjoying a cocktail reception, elegant dinner, delicious dessert and a late night snack. Please consider being a part of this amazing event in support of the school. Must be 21 years or older to attend. Bishop Rhoades will celebrate Mass at Saint Francis Chapel at the University of Saint Francis on Sunday, March 3, at 11 a.m.
Bishop Rhoades will celebrate the Rite of Election at the Cathedral of the Immaculate Conception on Sunday, March 3, at 2 p.m. Lunch ‘N Learn at St. Vincent de Paul Parish will host Melinda Richey who will discuss “Stretching in Place”: Tips and suggestions on how to stay flexible, how to stretch safely and stretches and exercises for standing and sitting on Monday, March 4, at 11:30 a.m. in Spiritual Center Room A, 1502 E Wallen Rd. Potluck lunch (please bring a dish to share). Open to anyone age 55 and over. St. Vincent de Paul Parish will celebrate Mardi Gras on Tuesday, March 5, with a New Orleans style dinner and activities for children from 5:30-7:30 p.m. in the Parish Hall. The “cookoff challenge” between Father Andrew Budzinski and Father Jay Horning will be a 6 p.m., bonfire and prayer service with music by Choristers Choir will be at 7:30 p.m. — school door #9. St. Augustine 18th Annual Mardi Gras Dinner Auction will be Tuesday, March 5, from 5:30-7:30 p.m. at St. Augustine Church, 1501 W. Washington St.
Before Lent, come for feast and fun at the 18th annual Mardi Gras dinner and silent auction of the Tolton Society of St. Augustine Catholic Church, 1501 W. Washington St.), from 5:30-7:30 p.m. on Tuesday March 5. Experience an authentic “Taste of New Orleans” (gumbo, dirty rice, music, king cake, etc)! Tickets at door are $20, $10 for pre-teens, age five and under free. Silent auction will include artwork, gift baskets, ND/SMC items, fine dining, etc. Proceeds will benefit the charitable works of the Tolton Society (named for Father Augustus Tolton, the first U.S. Black priest). For information contact Annie Tardy at artardy@hotmail.com, 574-707-1232. Please join the McGrath Institute for Church Life as it hosts a series of lectures focusing on the Chronicles of Narnia. The series is designed to accompany the audience as they make their way through reading the Chronicles of Narnia during Lent and into Easter. On each of the assigned dates, there will be two lectures. Lectures are free and open to the public. Generously sponsored by Knights of Columbus Insurance. March 5 – April 23, from 6:30-8:30 p.m. in the Parish Library (in the Gathering Space of the church – 1502 E Wallen Rd.) The group hopes to provide a comforting atmosphere in which to offer emotional support. Your loss need not be recent for the sessions to be helpful. Space is limited, so register in advance. Contact Claire Martin at 810-569-4935 or rmcm0813@gmail.com. Please join us as Fr. Ben Muhlenkamp leads the faithful during our monthly holy hour for vocations to the priesthood and religious life. Bishop Rhoades will celebrate Ash Wednesday Mass at 7 a.m. on Wednesday, March 6, at at the Cathedral of the Immaculate Conception. An interpreter from Deaflink, a service of The League for the Blind & Disabled Inc., will provide ASL (American Sign Language) at the Cathedral of the Immaculate Conception, 1122 S. Clinton, FW 46802 at several Masses during Lent and Holy Week including Ash Wednesday, March 6 at 12:05 p.m, Chrism Mass on Tuesday, April 16, at 7:30 p.m, Good Friday Service with Bishop Kevin C. Rhoades on April 19, at 1 p.m., and Easter Sunday, April 21, at 11:30 a.m. The Cathedral Parish and the Diocesan Deaf Ministry offer these special Masses and Service to encourage people to extend the invitation to family and friends who are deaf to attend Mass. If you would like to raise awareness for the Deaf Ministry and assist its efforts to provide support for the deaf members of the Catholic community in our diocese, please contact Allison Sturm at asturm@diocesefwsb.org or at 260-399-1452. An interpreter from Community Services All Deaf (CSAD) will provides ASL (American Sign Language) at St. Matthew Cathedral, 1701 Miami St., South Bend, for several Masses during Lent and Holy Week including Ash Wednesday, March 6, at 5:30 p.m., Chrism Mass on Monday, April 15, at 7:30 p.m., Good Friday Service, April 19,at 1p.m., and Easter Sunday, April 21 at 11 a.m. St. Matthew Cathedral Parish and the Diocesan Deaf Ministry offer these special Masses and Service to encourage people to extend the invitation to family and friends who are deaf to attend Mass. On Thursday, March 7, Richard P. Becker, R.N., M.S., M.A. Catholic Writer and Professor at Bethel College School of Nursing will speak on Cultivating a Culture of Care for Life in a Violent World at 7 p.m. at Holy Cross College Driscoll Auditorium as part of the Winter/Spring Catholic Social Doctrine Series. Homeschool parent-teachers and their children may attend a Tea Time Out, Friday, March 8, from 10 a.m. to noon in the Msgr. John Kuzmich Life Center, 1502 E Wallen Rd. Hostess will provide a variety of tea bag selections, paper products and some games to play. If you are able to attend, please bring some kind of tea and a treat or snack to share. Feel free to bring your favorite games too. Call Lisa with any questions. *Note on parking: Please park in the church lot and walk over to the Life Center. Join us RSVP to Lisa at: 637-1285, 206-2054 (cell/text) lcwinde@frontier.com. St. Patrick Parish will have an all-you-can-eat fish fry on Friday, March 8, from 4-7 p.m. Peanut butter and jelly sandwiches available for children. Tickets are adults $10, seniors 60 plus $9, children 5-10 $5 those 4 and under free. Drive thru and carry-outs available. A fish fry prepared by Tyner I00F will be Friday, March 8 from 4-7 p.m. at St. Dominic Church, 803 W. Bike St. Cost at door is $9 for adults and $4 for children ages 4-12. Knights of Columbus Council 12379 will host a drive-Through only fish fry on Friday, March 8, from 4:30-7 p.m. A $9 carry-out dinner includes: fish, breaded potato wedges, coleslaw, applesauce, and dinner roll. Fish-only meals are also available. Queen of Angels Church will have a Lenten “all-you-can-eat” Fish Fry on Friday, March 8 from 4:30-7:30 p.m. at 1500 W State Blvd. Cost is $10 for adults, $5 for children 6-10, and 5 and under are free. Carry-out is also available. Knights of Columbus Council No. 1790 in Garrett will hold a fish fry every Friday during Lent from 4:30-7 p.m. in the school gym. Tickets are $9 per person or $5 for kids under 12. St. Pius X Catholic Church, 52553 Fir Rd., will host the “Time of Mercy” with Father Michael Gaitley, Friday, March 8 at 7:15 p.m.
Join the Marian Missionaries of Divine Mercy, Redeemer Radio, and the Diocese of Fort Wayne-South Bend for an inspiring Mercy and Mary Retreat, featuring bestselling author of “33 Days to Morning Glory” and acclaimed speaker Father Michael Gaitley, MIC. Participants will receive a full immersion experience into Divine Mercy and Mary. Enjoy talks by Father Gaitley, Mass, Adoration, testimonies with the Marian Missionaries and more. The Indiana Holy Family Catholic Conference is Saturday, March 9 in Kokomo, Indiana. This 13th annual event will once again offer activities and programs for adults, students and children, as well as babysitting for children up to two years old. The day includes awesome speakers (Teresa Tomeo, Deacon Dominick Pastore, Chris Bray, religious Sisters from St. Francis of Perpetual Adoration, Dominican Sisters of St. Cecelia), gym time with bounce houses, Adoration time for each classroom with instruction from one of our sisters, a hot catered meal (included in cost) and family fun time after lunch, an indoor Eucharistic procession, Adoration Chapel, confession, and will conclude with Mass with Bishop Timothy Doherty as the celebrant. What a great opportunity for you and your family to grow in your faith this Lent. The Bishop Luers Boys Soccer team will host a fun 2 day camp for boys in grades 5-8, Saturday and Sunday, March 9-10. Campers will receive instruction from the coaching staff and receive a camp T-shirt. The Knights of Columbus Council No. 5521 will have a Lenten fish fry at the South Bend Francis Club, 61533 Ironwood Rd., on all Fridays during Lent, including Good Friday, from 5-7 p.m. Adults $9.50, children 5-12 $3.50, children under 5 free. Shrimp is also available for $9.50, and cheese pizza for $1 per slice. Tickets are available at St. Anthony de Padua Catholic Church, 2114 E Jefferson Blvd. Tickets are adults: $12, good for any choice of a Friday in Lent. Available menu is baked and fried fish or pierogi, salad, French fries, cole slaw, lemonade, green beans, dessert, cash bar. Children tickets available at the door. Bishop Rhoades will celebrate 9:30 a.m. Mass at St. Casimir Church on Sunday, March 10. Join the Sisters of the Holy Cross as they celebrate National Catholic Sisters Week on Sunday, March 10. Come meet with the sisters who will be sharing about the Congregation and their own lives of ministry, after the 9:45 a.m. and 11 a.m. Masses at the Church of Our Lady of Loretto, on the Saint Mary’s campus. Masses Interpreted for the deaf are held on the second and fourth Sundays of the month at 11 a.m. at St. Matthew Cathedral, 1701 Miami St. An interpreter from Community Services All Deaf (CSAD) provides ASL (American Sign Language). St. Matthew Cathedral Parish and the Diocesan Deaf Ministry offer these monthly Masses and encourage people to extend the invitation to family and friends who are deaf. If you would like to raise awareness for the Deaf Ministry and assist its efforts to provide support for the deaf members of the Catholic community in our diocese contact Allison Sturm at asturm@diocesefwsb.org or at 260-299-1452. A Mass interpreted for the deaf will be held on the second Sunday of each month at the 11:30 a.m. Mass at the Cathedral of the Immaculate Conception in downtown, Fort Wayne. An interpreter from Deaflink, a service of The League for the Blind & Disabled Inc., will provide ASL (American Sign Language). The Cathedral Parish and the Diocesan Deaf Ministry offer this monthly Mass (Second Sunday at 11:30 am) and encourage people to extend the invitation to family and friends who are deaf to attend Mass. If you would like to raise awareness for the Deaf Ministry and assist its efforts to provide support for the deaf members of the Catholic community in our diocese, please contact Allison Sturm at asturm@diocesefwsb.org or at (260) 399-1452. Bingo will be held at St. Joseph – Hessen Cassel on Sunday, March 10. Doors open at 2 and games start at 2:30 p.m. Cost is $25/person and includes 10 games with payouts from $25 to $100. Must be 18 to play. Bring items for the food bank to receive extra door prize tickets. Bishop Rhoades will celebrate the Rite of Election at St. Matthew Cathedral on Sunday, March 10, at 2 p.m. The Diocesan Museum, formerly known as Cathedral Museum, will reopen in a new location, 1103 S. Calhoun St., Fort Wayne, in the former diocesan chancery building at the southeast corner of Calhoun Street and Jefferson Boulevard. The grand opening celebration takes place Tuesday, March 12, at 10 a.m. The public is invited to attend. Regular museum hours will be 10 a.m.-2 p.m. Tuesday-Saturday and by appointment. The first 50 visitors will receive a copy of “Worthy of the Gospel of Christ, a History of the Diocese of Fort Wayne-South Bend,” by Joseph M. White. Pre-k and kindergarten orientation and registration for parents will be Tuesday, March 12, from 6-7 p.m. Parents will meet the teachers, tour the school and receive important information for their upcoming Pre-k or kindergarten school year. Exciting news about the upcoming Kindergarten Camp. Childcare will be available in the Pre-k classroom. The theme for the day is “Wandering with God. Please register by Friday, March 8. Food and Fellowship will be offered on the following Wednesdays during Lent: March 13, 20, 27 and April 3, 10, 17. Food served from 5-6:30 p.m. in the Parish Hall followed by Mass at 7 p.m.
Soups are served with a variety of bread and crackers, all for a free-will offering. To-go containers are available also. Additionally, there is a HOMEMADE DESSERT Table that changes from week to week. Pies, cheesecakes, trifles, gourmet brownies, fruit cobblers, etc. Desserts are priced based on size. All profit goes to the Tuition Fund. The three-part St. Vincent de Paul Lenten Series: Standing with Christ in Gethsemane: being Faithful to the Light in the Midst of the Church’s Darkness, will begin Wednesday, March 13, at 7 p.m. in the church, 1502 E Wallen Rd. Another evening of reflection with Father Daniel Scheidt on exploring what health in the Church needs to look like. Donald Schmid (former Federal Prosecutor, member of our Diocesan Review Board and advisor to the National Conference of Catholic Bishops) discusses the goodness and the necessity of the laity furthering transparency and accountability in the Church. Artist and teacher, Anastassia Cassady, exhibits 20 of her sketches of the homeless of the city and describes how to find the face of Christ in the distressing guise of the poor. The Knights of Columbus Council No. 5570 is sponsoring an “all-you-can-eat” spaghetti dinner, Thursday, March 14, from 4-6 p.m. Adults $8, children ages 5 to 12, $2.50. Dinner includes spaghetti, salad, bread, beverages and dessert. Cost: $10 Adult Dinner | $5.00 children 6-12 | under 6 free! The Our Lady of Hungary Holy Name Society will have a fish fry on Friday, March 15, from 4-6:30 p.m. in the school gym. Meal includes macaroni and cheese or baked potato, cole slaw and ice cream. Tickets are at the door and $10 for adults, $5 for children 6-12 and children under 6 free. Carry outs available. In observance of Lent, please bring a voluntary donation to the Food Pantry of a non-perishable food item. St. Anthony de Padua will host a parish fish fry on Friday, March 15, from 4-7 p.m. in the gymnasium. Adult carryout will be available. Tickets are available for purchase online, via printable form, after weekend Masses and at the parish office. Pre-sale tickets are adults: $9, seniors: $8, children 5-10 $5. Tickets at the door are adults: $10, seniors: $9, children 5-10 $6. St. Jude Church will have a Lenten fish fry on Friday, March 15, from 4:30-7:30 p.m. at 2130 Pemberton Dr. The cost will be: adults $10; children ages 6-10 $5; children 5 and under are free. Sides to include, scalloped potatoes, cole slaw, applesauce, and a dessert from the fresh baked cookie table. PBJ sandwiches available for younger kids under five not wanting fish. Carryout is also available. A fish dinner sponsored by the St. Vincent Boy Scouts will be held three Fridays: March 15, March 29, April 12 from 5-8 p.m. in the parish hall — school door No. 9. All the fish you can eat includes dessert, mac and cheese, cole slaw, roll, potato and drink. Tickets are adult $10, children 6-11, $5. St. Patrick Parish, 807 Tyler St., will have a dinner on Saturday, March 16, from 5:30-10 p.m. in Letko Hall. Dinner includes corned beef (breaded boneless chicken thighs optional), cabbage, red potatoes, carrots, rye bread, salad, dessert, table snacks, coffee and open bar (Beer/Wine/Soft Drinks). Musical entertainment before and after dinner and a commemorative glass. Tickets available for purchase through March 10 for $15 per person, adults only (21 years and over). 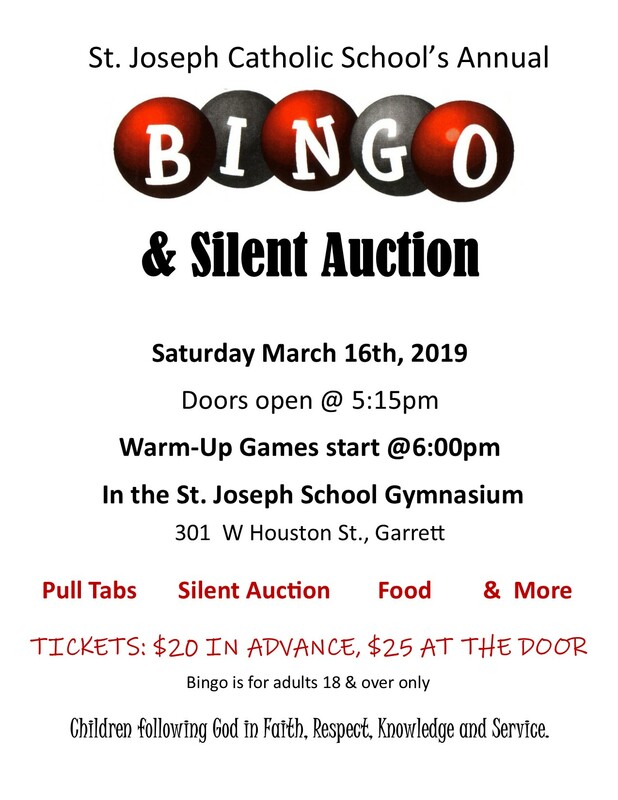 St. Joseph Catholic School will hold a merchant Bingo and silent auction fundraiser on Saturday, March 16, from 6-9:30 p.m. in the school. The doors will open at 5:15 p.m. and warm-up games will start at 6 p.m. Bingo will be open to adults 18 and over only. The pre-sale tickets are $20 and at the door will they will be $25. All proceeds will go to St. Joseph Catholic School. 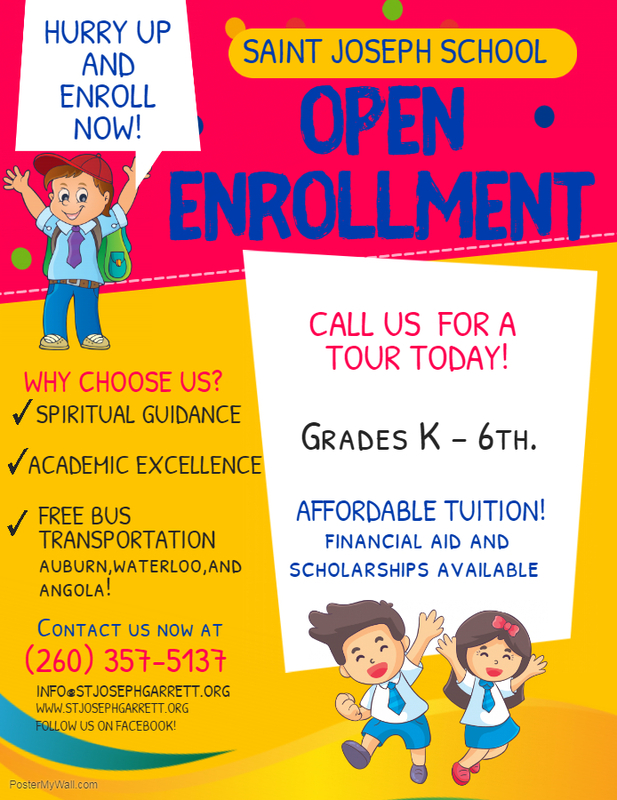 Call the school for further information at 260-357-5137. 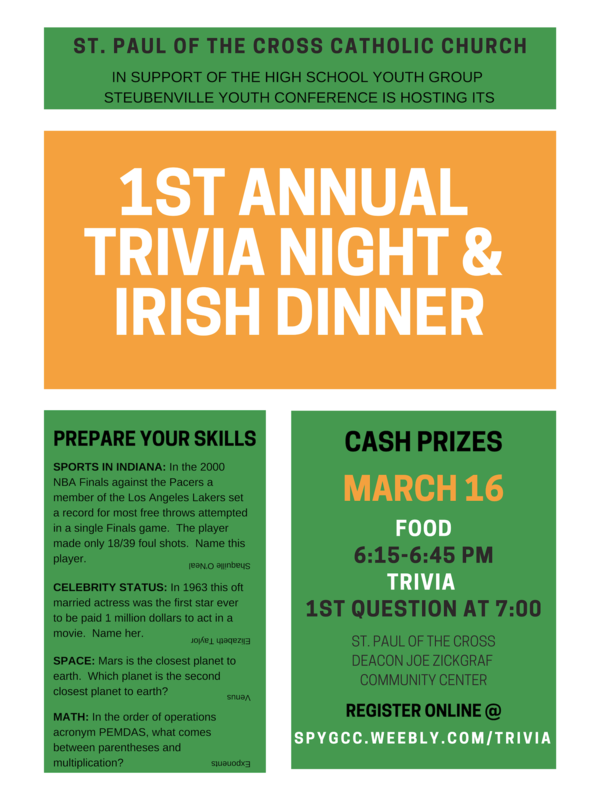 St. Paul of The Cross Parish will host a trivia night Saturday, March 16, from 6-10 p.m. at the church, 315 S. Line St. Gather teams of 8-10 for a fun night of trivia while supporting the St. Paul of the Cross Youth Group’s trip to the Steubenville Youth Conference. Bring out your best Irish-themed table decorations and enjoy an optional Irish buffet before trivia from 6:15-6:45 p.m. Trivia begins at 7 p.m. Register at www.spygcc.weebly.com/trivia. St. Paul of the Cross will host their first ever Trivia Night Saturday, March 16, at 6:15 p.m. to raise money for the Youth Group to attend the Steubenville Youth Conference. The CCHS Alumni Association will have an Open House March 17, from 1-3 p.m. at the East State Professional Park, 4618 E. State Blvd Ste. 100 (South end of the building from Redeemer Radio at State and Reed). For information call Leanne 260-493-0290 or Sylvia at 260-493-7479. Mass will be celebrated at 1 p.m. by Father Levi Nkwocha in the St. Patrick Oratory, 950 Main St. in Lagro. Mass will be followed by meditation, lights and prayer with harpist, Sarah Wall, at 2:30 p.m. Fellowship and refreshments will conclude the celebration at 3:30 p.m.
Friends of St. Patrick’s members will be available to answer any questions you may have about the history of St. Patrick Church. St. Louis Besancon Catholic Church will have a Parish Mission, “Rebuilding the Path to Christ,” on Sunday, March 17, in the hall. A light supper will be from 5:15 – 6:30 p.m. Opening prayer service with speakers Brad and Elaine Smith on the topic: Rebuilding the Path to Christ with Faith will be followed by a small group discussion. On Monday, March 18, following a light supper in hall from 5:15 – 6:30 p.m. the mission will move to the church for speaker Dan DeMatte on the topic: Rebuilding the Path to Christ with Prayer followed by adoration. On Tuesday, March 19, a light supper will be followed by a penance service/examination of conscience with speaker Father Jay Horning on the topic: Rebuilding the Path to Christ with the Sacrament of Reconciliation. Several priest will be available. Holy Eucharist. Supper will follow in the hall. Christ the King Parish will offer a Lenten retreat, “Our Family in Faith at Prayer” Sunday, March 17 through Tuesday, March 19 at 7 p.m. in the church. Retreat Leaders are Most Rev. William Wack, CSC and Rev. Neil Wack, CSC. With the Holy Family as the guide, come to the parish retreat and grow as a family at prayer. Bishop Bill Wack and Father Neil Wack grew up at Christ the King Parish and graduated from the grade school. Come and enjoy their reflections on life in prayer as a family at faith. Romero Days Conference "Belonging: The Church of Romero and the Gangs"
The canonization of Archbishop Óscar Romero in 2018 brought renewed attention to the slain priest’s witness and legacy of promoting social justice. 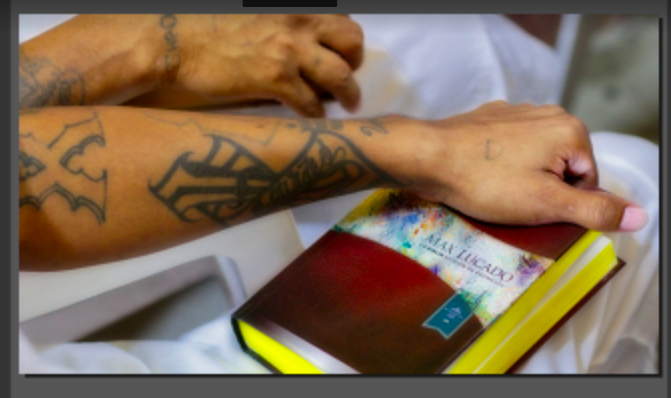 The Romero Days conference held March 18-20, will show how a diverse host of leaders who wish to honor Archbishop Romero might respond pastorally and politically to the transnational reality of gang violence now in our midst. A Haven for Healing offers spiritual renewal for those who have experienced the loss of a child from abortion. Do you suffer from carrying a secret that makes you feel isolated? Have you received the Sacrament of Reconciliation and yet cannot forgive yourself? Are you tired of carrying the burden of guilt and shame? A Haven for Healing can help. We use a Bible study and discussion to address many issues that arise after an abortion. Group or individual sessions are offered. The group sessions begin Monday, March 18, at 6:30 p.m. Call the confidential phone line 574-514-7471 or email ahavenforhealing@gmail.com for more information. The Knights of Columbus will assist in the celebration for the Feast of St. Joseph beginning with Mass Tuesday, March 19, at 5:30 p.m. The Knights of Columbus will be sponsoring a spaghetti dinner immediately following Mass. Inspirational speaker Robert Rogers is coming to St. Elizabeth Ann Seton on Tuesday, March 19, at 6:30 p.m. in the church, 10700 Aboite Center Rd. In 2003, Robert Rogers experienced a tragedy of Biblical proportions. After 8 years as a father, nearly 12 years as a husband, and 13 years as an electrical engineer, Robert’s life completely changed one night on their way home from a wedding in Wichita, Kansas. Through his immediate trust in God, Robert has risen above adversity and freely shared his compelling message across the country by invitation over 1,200 times to at least 280,000 people personally, as well as with ABC, CBS, CNN, EWTN, Montel Williams, Integrity Film & Video, the Billy Graham TV Crusade, and Focus on the Family. An accomplished worship leader, pianist, songwriter, and author of 4 books, “Into the Deep,” “7 Steps to No Regrets,” “Rise Above,” and “Pass the Test,” Robert teaches others to live a life of no regrets with his inspiring words and original songs at the piano. St. Mary of the Assumption Church, 414 Madison St., will have a Parish Mission March 19-21 from 7-8:30 p.m. in the church. Susan Tassone, award winning author and regular guest on EWTN, will speak Tuesday and Wednesday evenings and be available for book signing afterward. Her talks are titled “A Guide to Saving Grace: Purgatory, Adoration and Divine Mercy” based on her book “Day by Day with the Holy Souls in Purgatory” and her newest release “St. Faustina Prayer Book for Adoration.” The Sacrament of Confession will be celebrated Thursday at a Lenten Penance Service with many priest confessors available. All are welcome. Belonging “Building Inclusive Parishes” will have a meeting Tuesday, March 19, from 7-8:15 p.m. at the Archbishop Noll Catholic Center, 915 S. Clinton St.
“Belonging” is comprised of parents, educators, parish staff members, diocesan personnel and individuals who work to advocate for the dignity, acceptance and inclusion of all persons with disabilities in church, school, and pastoral ministries by promoting full and meaningful participation of people with disabilities in all aspects of the life of the Church and society. Father Tyrell J. Alles, OSB, pastor of St. Peter Parish, will present a talk in the Parish Pavilion, 506 E. DeWald St., on Wednesday, March 20, beginning at 6:30 p.m. This presentation will study the passion and death of Jesus through a close reading and exegesis of Luke 22:1–23:56. This study will also show the implications of Jesus’ passion and death on our life of Christian discipleship. Please bring your bible. Call 260-744-2765 with any questions. Dr. Vincent Wargo, associate professor of philosophy, will speak Tuesday, March 20, from 7-8 p.m. in the Brookside Ballroom about “Charles Taylor on Secularity and Social Imaginaries.” Charles Taylor is a leading Catholic philosopher who in his various writings has taken up the question of what it means to live in a secular age. Dr. Wargo will give an overview of Taylor’s thought on this topic and will invite discussion on the possibility of practicing one’s faith in such an environment. The second of the three-part St. Vincent de Paul Lenten Series: Standing with Christ in Gethsemane: being Faithful to the Light in the Midst of the Church’s Darkness, will be Wednesday, March 20, at 7 p.m. in the church, 1502 E Wallen Rd. Seeking GOODNESS: Donald Schmid (former Federal Prosecutor, member of the Diocesan Review Board and advisor to the National Conference of Catholic Bishops) discusses the goodness and the necessity of the laity furthering transparency and accountability in the Church. St. Pius X Catholic Church is hosting a “Grieving with Hope” speaker series Thursday, March 21, from 7-8:30 p.m. in the church, 52553 Fir Rd. At the first event, Holly Farmer from the Center for Hospice Care will present on “Understanding Grief and Loss.” Drawing on her extensive experience as a bereavement counselor, Holly will define grief and mourning for youth and adults, describe the mourning process and grief reactions, discuss coping and self-care, and explain ways to support grieving individuals. Her presentation will be followed by time for questions. Light refreshments will be served afterwards. If you are grieving or supporting someone who is grieving, we invite you to come. A fish fry will be Friday, March 22, from 4-7 p.m. at St. Patrick Church, Walkerton. Tickets are $9/adult, $4/children 6-10 years and children under 6 years are free. The meal includes all the fish you care to eat, two sides, drink and dessert. Drive-through carryouts available at $9 each (no “all-fish” carry outs). Fish prepared by Tyner 100F Lodge. St. Matthew Cathedral will have a fish fry Friday, March 22, from 4-7 p.m. in the school gym. Tickets are adults $10, children 12 and under free. Dine-in only, all carry-out meals $10. A Jonah fish fry will be Friday, March 22, from 4-7 p.m. in the Corpus Christi School gym, 2817 Corpus Christi Dr. Adults and carryout: $12, (advance sale: $10); children 6-12 $4; children under six, free. 4 pieces of fish, coleslaw, bread, chips, and cookie. St. Patrick’s Church, 12305 Arcola Rd., will have a drive-through only fish fry Friday, March 22, from 4:30-7 p.m.
St. Aloysius Parish will hold a fish fry on Friday, March 22, from 4:30-7:30 p.m. The menu includes: Fried Fish (all you can eat), Scalloped Potatoes, Coleslaw, Roll, Drink and Dessert. Cost is $10 for adults, $5 for children ages 6-11, 5 years old and under free. St. Aloysius is located at 14623 Bluffton Rd., Yoder (just south of I-469 on Hwy. 1). St. John the Baptist Parish, 4500 Fairfield Ave. will have a Dan’s fish fry from 5-8 p.m. in the PAC. Tickets are adults 13 and over, $10, children 6-12, $5, and children 1-5 $2, Carry out $10. All are welcome. Need a little marriage freshener? Take a weekend off and spend it with your significant other. Discover how easy it is to return back to the early days of life when you both focused your time and energy on each other. Leave the chores and work behind. The next weekend begins March 22, in South Bend. Go to wwme.org to learn about the weekends. Go to wwme-ni.org to apply. Have questions or need to talk to someone, call Greg and Jen at 260-422-0803. If you have lost a baby, you are not alone. Come join other couples who have suffered miscarriage, stillbirth or infant loss for a daylong retreat, free of charge, to help face your grief in the context of fellowship and faith. The retreat will be held on Saturday, March 23, from 10 a.m. to 4 p.m. at the Sacred Heart Parish Center on the outskirts of Notre Dame’s campus. Lunch will be provided. While this retreat is geared for couples, individuals are welcome as well. Sponsored by “ava’s grace,” a new diocesan ministry to support families grieving the loss of a baby before or after birth. To register, contact Lisa Everett at leverett@diocesefwsb.org or by calling 574-234-0687. Cost: $8 for adults, $4 for children 6-12, and $20 per family. $5 carryout packs will be available. Saint Gaspar del Bufalo Council No. 11043 will be serving breakfast on Sunday, Mar. 24, from 9 a.m. to 12 p.m. in the gymnasium at Most Precious Blood, 1515 Barthold St. Cost is $8 for adults, $4 for children 6-12, and $20 per family. Proceeds this month will help support Gibault Children’s Services. Masses Interpreted for the deaf are held on the second and fourth Sundays of the month at 11 a.m. at St. Matthew Cathedral, 1701 Miami St. An interpreter from Community Services All Deaf (CSAD) provides ASL (American Sign Language). St. Matthew Cathedral Parish and the Diocesan Deaf Ministry offer these monthly Masses and encourage people to extend the invitation to family and friends who are deaf to attend Mass. If you would like to raise awareness for the Deaf Ministry and assist its efforts to provide support for the deaf members of the Catholic community in our diocese, please contact Allison Sturm at asturm@diocesefwsb.org or at 260-299-1452. Bishop Rhoades will celebrate the Pueri Cantores Mass on Monday, March 25, at 3 p.m., at St. Charles Borromeo Church, Fort Wayne. The WAF FW-SB invites you to celebrate the Annunciation of Our Lord Thursday, March 25, at 6 p.m., at St. Jude Parish, Fort Wayne. Father Mark Enemali, celebrant, will present on the topic of Fatima. Rosary and Benediction — reception to follow. Wings Etc is helping Knights of Columbus Council 11276 raise money for St. Elizabeth Ann Seton school Scholarships. Please see attached flyer for more details. Make sure you bring the coupon on the bottom of the flyer with you. The McGrath Institute for Church Life hosts the 2019 Human Dignity Lecture, with world-renowned speaker, Obianuju “Uju” Ekeocha. Ms. Ekeocha is the founder and president of Culture of Life Africa, and author of “Target Africa: Ideological Neo-colonialism of the Twenty-first Century.” She has spoken before the United Nations and the Canadian Parliament. She has also appeared on the BBC’s “Focus on Africa.” Sponsored by the Notre Dame Office of Life and Human Dignity. Reception to follow. 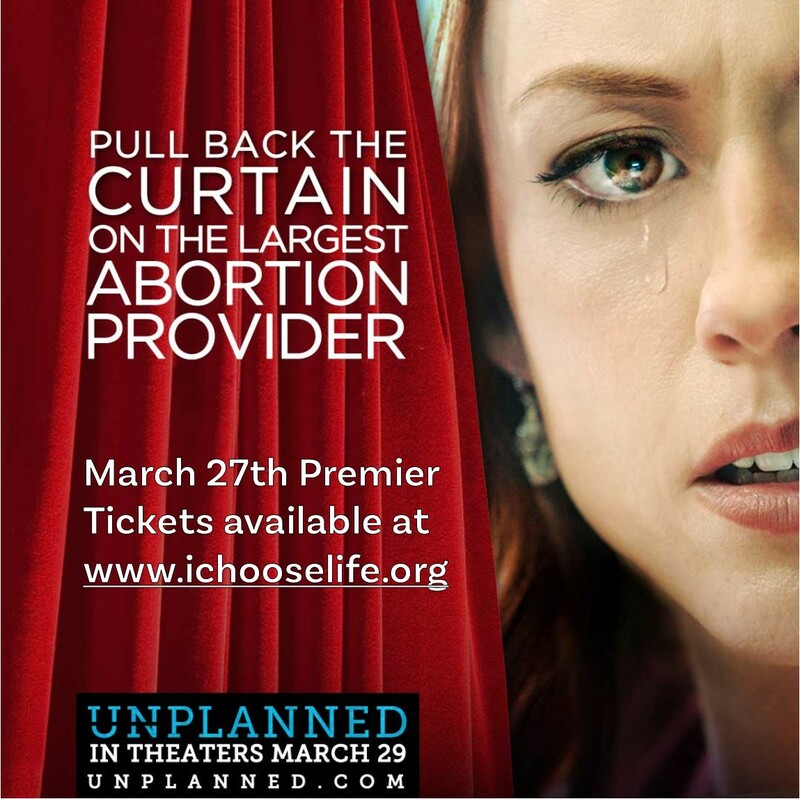 Unplanned is based upon the true story of pro-life advocate Abby Johnson, former Planned Parenthood Clinic Director. A limited amount of tickets will be sold to a private showing on Wednesday, March 27, at 7 p.m. (arrive 6:30-6:45 p.m.) at AMC Classic Fort Wayne on 3930 E Dupont Rd. Tickets are $15 and limited in quantity. Purchase yours early to secure a seat. Proceeds from ticket sales will benefit Allen County Right to Life. The last of the three-part St. Vincent de Paul Lenten Series: Standing with Christ in Gethsemane: being Faithful to the Light in the Midst of the Church’s Darkness, will be Wednesday, March 27, at 7 p.m. in the church, 1502 E Wallen Rd. Artist and teacher, Anastassia Cassady, will exhibit 20 of her sketches of the homeless of the city and describes how to find the face of Christ in the distressing guise of the poor. On Thursday, March 28, Philip J. Sakimoto, Ph.D., University of Notre Dame Minor in Sustainability/First-Year of Studies Program and NASA will speak on What is Happening to Our Common Home: Laudato Si’, Climate Change and Creation Care at 7 p.m. at Holy Cross College Driscoll Auditorium as part of the Diocesan Winter/Spring Catholic Social Doctrine Series. The St. Mary, Huntington, Rosary Sodality is sponsoring a Lenten fish fry on Friday March 29, at the school gymnasium from 4:30-7:30 p.m. Adult Meals are $10 and children 5 and older $5. Fish is by Dan’s Fish Fry with 50/50 raffle, desserts and a bake sale. Boy Scout Troop 302, chartered by the GM UAW Local 2209, will have a fish fry fundraiser for Scout supplies. All you can eat Fish served with Baked Potato or French Fries, Coleslaw or Applesauce. Tickets are $9 adult, $5 child ages 5-9. Donations accepted for the bake sale desserts. The retreat will be held at St. Monica’s Catholic Church in Mishawaka the weekend of March 29-31 starting Friday at 6 p.m. and ending Sunday around 4 p.m. If you are a college student, or a college-age young adult anywhere near the South Bend area, please join us for Zenith Awakening 3. As a retreat hosted by college-age young adults for college-age young adults, Awakening is a wonderful, Holy Spirit-filled weekend to connect to new friendships in the area and grow closer to God wherever you are in your life. The retreat consists of talks, laughter, small groups, discussions, and opportunities to encounter Christ through prayer, fellowship and fun. Go to facebook.com/zenithawakening or to www.diocesefwsb.org/zenithawakening for more information and to register. Join others on Friday, March 29, at St. Augustine Catholic Church, 1501 West Washington St., for soulful Stations of the Cross. Soup and salad dinner are from 6-7 p.m. with Stations at 7 p.m. This event is sponsored by Black Catholic Advisory Board for the Diocese of Fort Wayne-South Bend and St. Augustine. The Holy Cross Family Spring Conference presented by the Brothers of Holy Cross and the Holy Cross Associates will be Saturday, March 30, at Holy Cross College Auditorium from 9 a.m. to 2:30 p.m. and free to all. There is a $10 fee if you wish to join for the luncheon. Keynote speaker is Father Anthony Gittins, CSSp, author of fifteen books about mission and spirituality. Praying and reflecting, tapping inner resources to meet the challenges at this time in the church, country and world. For more information or for luncheon reservations before March 26, contact Brother Carl at 760-610-9373. Active and auxiliary members of the Legion of Mary are invited to renew their promise to Our Lady at the ACIES Ceremony. Contact Elsie at 547-259-6215 or Lora at 260-422-4061 for more information. St. Bavo Church, 511 W. 7th St., will have a LAETARE (rejoice) Sunday concert March 31, at 4 p.m. It will feature choral singing, talented soloists, congregational hymns and a reflection by pastor, Father Pete Pacini, CSC. Traditionally, the 4th Sunday of Lent has been a day of celebration within the austere period of Lent. All are welcome to celebrate. There is no admission charge.